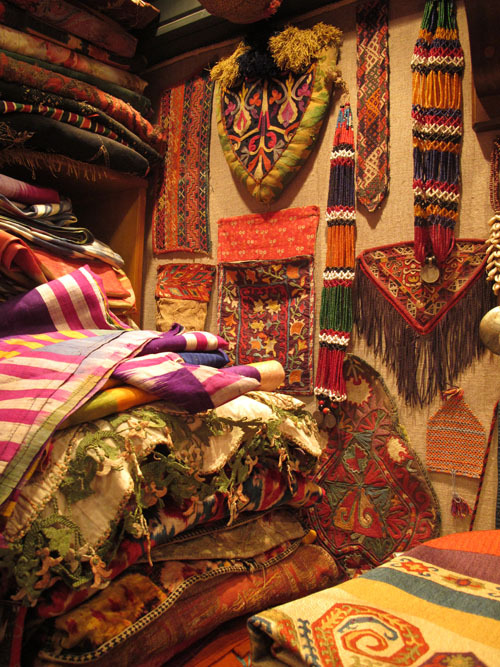 This is our last day in Turkey and I have to share these images from the bazaars of Istanbul. 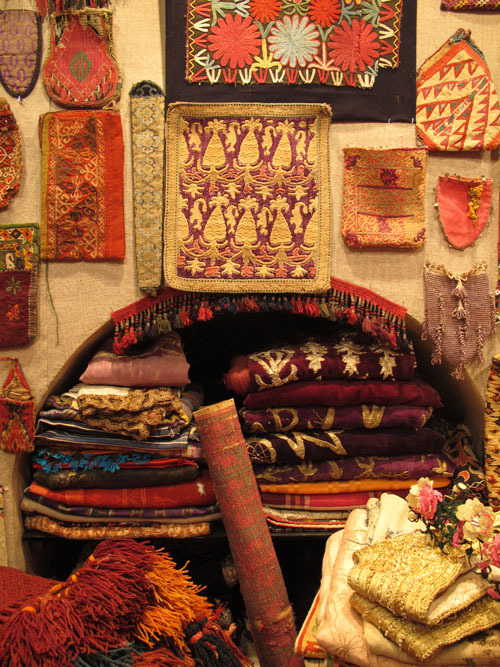 There are textiles galore, with pushy carpet sellers at every turn. I bought a few meters of this fabric to make into a shirt. I’ll be showing LOTS more pictures of Turkey when I return home. 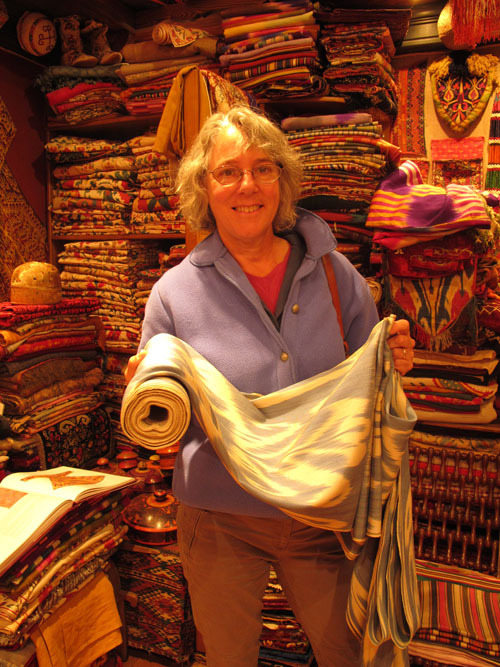 This entry was posted in Inspiration, Travel, Treasures, Turkey by Salley Mavor. Bookmark the permalink. Gorgeous fabrics, love how they weave and embroider the pieces, beautiful work. yellows and purples and reds oh my! i had no idea there would be so many to choose from….can’t wait to see how this trip influences your lovely work…. What a tempting place to shop! I’d have a hard time not going nuts! Oh my! I think I would need to be dragged out of there by force…. Such beautiful colors and they all have a vintage/organic/natural look. I am guessing your creative brain is whirling with possibilities and imagining new art pieces by the dozen! Oh, my, look at all those wonderful fabrics!!!!! You must have had a wonderful time and gained some new inspiration!!!!! i just wiped the drool off my chin. Salley, those shops look the same-just as luscious and colorful, as when I saw them waaaayyyy back in 1986. That seems a lifetime ago. Hey, it was– most of Brennan’s lifetime. Sabin got sick and stayed in the motel a lot so I wandered around Istanbul by myself. Painted a lot of watercolors and took pictures, on film. 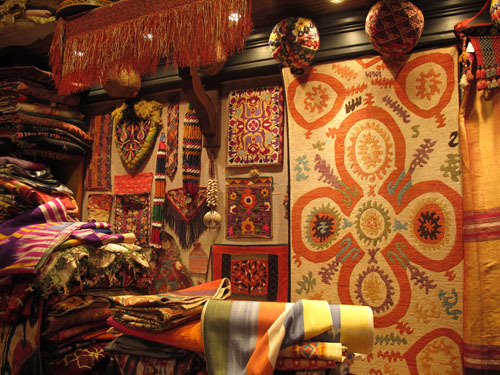 BTW, did buy 3 rugs, and carted them around europe with us ’til we got home. 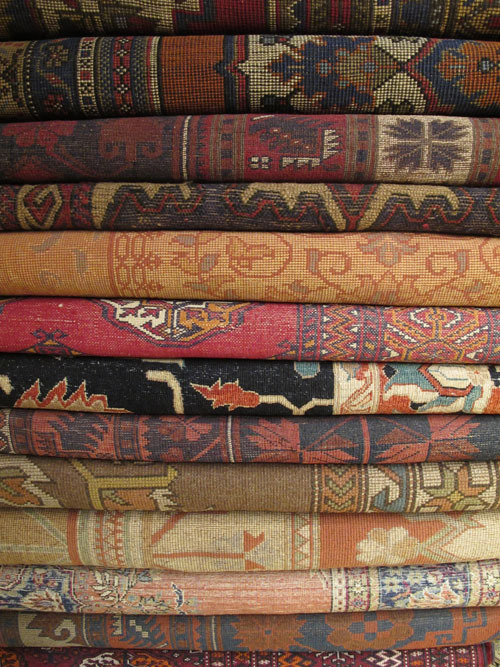 One was rather fine and hangs on the wall, the other two just big, old kilims. PS, Aren’t the Turkish men just so handsome? Hi Ashley, Thanks for telling me about your trip to Turkey. We got to know a few Kurdish waiters at our favorite resaurant–so handsome, chaming, playful and respectful of women. Got home late last night and the trip seems like a dream. 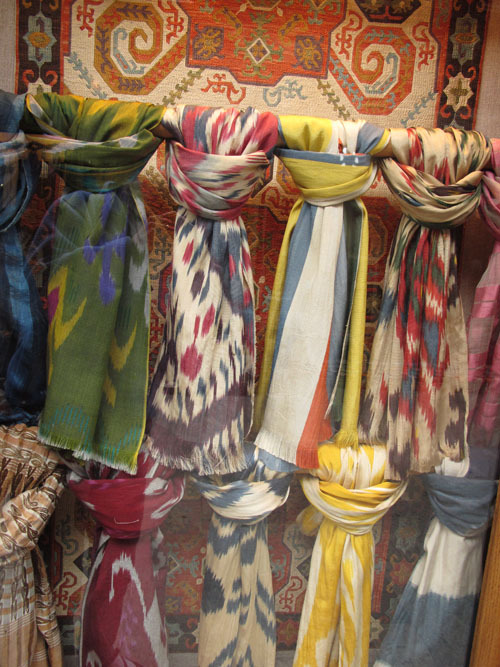 I love the look of Ikat…I imagine that it originated in Turkey, or somewhere nearby. Thanks for sharing these colorful and lovely images! Your new shirt will be so comfortable, I bet, and will always remind you of your visit…maybe you can wear it on “Turkey Day”, which is just three weeks from today! 😉 Happy and safe travels home to Cape Cod.